Power of the Rosaries from the Holy Land!! A Mother Superior wrote to me about her experience in Sydney Australia with the Olive Wood Rosary I sent her which had touched all the holy sites. Greetings in the Lord Jesus Steve and Janet!!! and welcome home from what looked like a thoroughly blessed pilgrimage to the Holy Land!! I saw your wonderful videos of the entire pilgrimage and it truly felt like we were there! Thank you for sharing this experience – I felt like one of the pilgrims almost!! When I was in Sydney I had been working closely-spiritually speaking- along side with the exorcist of the Diocese, praying for him whenever he had an exorcism to perform etc. There was one particular lady who was possessed by a few demons and she came to our Monastery for an exorcism. ( This poor lady suffered unspeakable horrors at the hands of her father and mother). To cut a long story short, when I was talking with her in our Guest House I wondered if the demons were still within, and so I took out the Holy Land Rosary you gave me last year with other goodies, and knowing the spiritual graces that come with it (according to the Raccolta) and I gently placed the rosary on her lap. What happened next surprised me . ….after a short while she suddenly jerked her leg wincing with pain. Amazed I took my rosary back and put it into my pocket….and thanked the Good Lord for granting me such a precious and powerful gift! So thank you Steve and Janet!!! Even the demons know how powerful it is! I have since used it for others who had similar demonic possessions and I can assure you – it is a most powerful in the supernatural realm!!!! 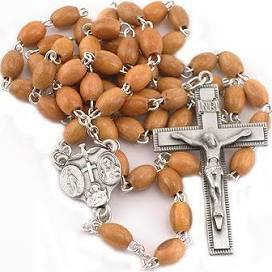 On each of our trips we offer olive wood Rosaries to our groups. These are made by Sisters in Bethlehem. We touch them to all the holy sites, especially all the Rosary sites. They are all blessed in Jerusalem before the pilgrims head back home.